The walk starts in Dunsop Bridge just to the left of the post office. A straight tracks leads to cottages, 20 yds after which the FP is found on the right over a stile and up the steep bank. After the next stone stile a steady walk uphill leads direct to Beatrix. Follow the tarmac road around Beatrix and at the second house take the left of the two double gates. The track leads to Back of Hill Barn, after which bear slightly left. A gentle walk downhill over two stiles leads to the crossing over Rough Syke and then straight uphill to Rough Syke Barn. The walk continues to a ladder stile; a second similar stile is met with a little further on. Follow the track which after a short while turns sharp right. Keep straight on through the wooden gate when the track turns sharp left. The path leads direct to Gamble Hole Farm. Aim just to the left of the farm, go through the farm gate, and carry straight on. At the end of the first field bear left into the second field and walk diagonally to the far left hand corner to meet the road. The FP carries on across the road and goes over a beck. On ascending the other side bear right; the path now goes through a series of fields down hill to Newton. From the Parkers Arms walk down the road and find the start of the path on the right after crossing the bridge over the Hodder. The path follows close to the bank of the Hodder and then over a series of stiles and fields to emerge on the road just to the left of the house at Foulscales. A short walk on the road leads to a farm track on the right just after the last barn. A FP sign is seen on the right a little way along this track; the path leads to a footbridge over the Hodder, across sheep pasture to a stile just to the right of Knoll Wood, and then onto the road. The FP starts again after a short walk down the road past Boarsden and just to the right of the cottage. The path leads downhill to the Hodder and follows the north bank of the river ending in the road leading to Thorneyholme Hall. Turn right to the car park in Dunsop Bridge. 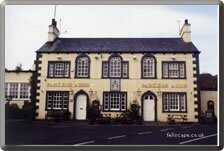 offers a selection of real ales and home cooked fayre using local produce. Opens: Weekdays 11.00 - 23.00; Sundays 12.00 - 22.30. The walk starts from the car park in Dunsop Bridge. The objective should be the Parkers Arms in Newton. The path to Newton is particularly pleasant passing by hill farms and their outlying barns with views to the south over the Hodder valley. 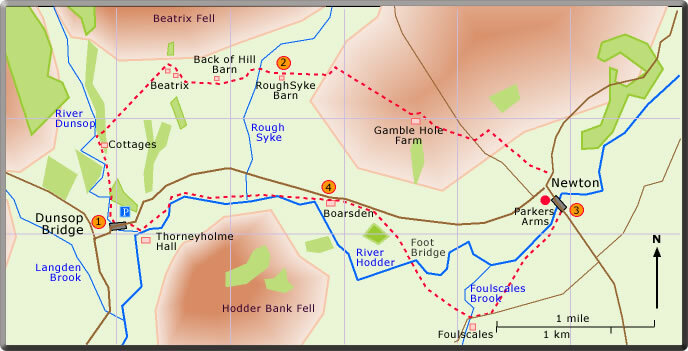 An initial gentle climb to Beatrix is followed by a descent to Rough Syke, and then again a climb to Gamble Hole Farm. Newton is seen in the valley below. The return from Newton is on the flat. For the most part the path follows close to the Hodder or otherwise over pasture.